Through research and experimentation, Home Grown is coming up with provocative ways to question our reliance on unsustainable resources and to challenge the world to think of better solutions. We already grow a lot of our food in the home, but we have yet to consider how we can grow protein, one of the least sustainable foods we rely on. Home Grown is designing products and experiences that help us better consider the future of our food and how we all can have a say in what we eat and how it is grown. Food is one of the most important things in our lives, no matter what we do we have to eat. Where our food comes from, what value we hold for it, and how it is produced should be of concern, however is does not have to overwhelm our lives. We can broach these issues by looking at food from a human scale and taking our time with it. We have the power to grow our own food in order to create sustainable, fulfilling lives. We nurture a lot of things in our lives, our family, our children, our relationships, ourselves... And a lot of the time, we use food to do the nurturing (for instance chicken noodle soup on a sick day), but do we think about nurturing about our food? Home Grown promotes the care and consideration of the food we raise in our home by utilizing our empathy for living things and reconnecting the value of our food. Storytelling is an inherently human trait. Through conversation we are able to share ideas and discoveries that have the potential to change the way we see the world. Home Grown encourages intimate activism - the sharing of information from person to person through conversations. Oftentimes we are led to believe that the loudest one in the room is the one that is heard, but by slowly building networks and connections and sharing our ideas on a personal level we are able to create more meaningful ties to a movement. 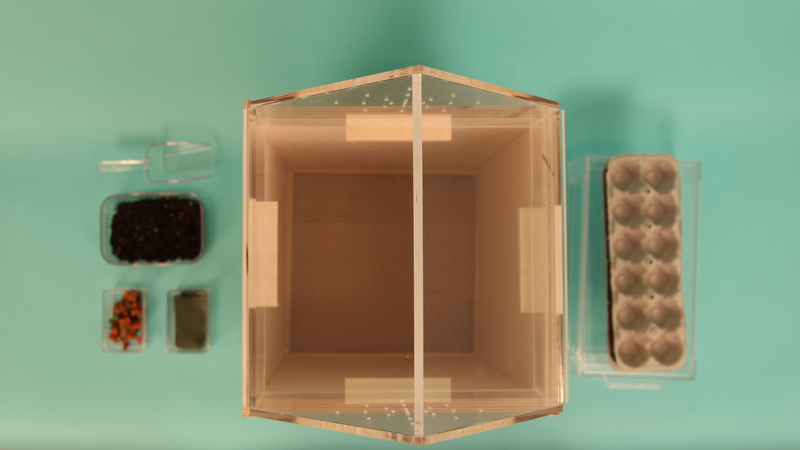 The Home Grown Cricket Farm is the first concept developed for the project. It is a prototype and an example of how one could begin living with their food. The farm is functional and addresses the aspects required to care for and maintain a person's cricket population. Sign up for our newsletter to be updated about our events and projects. For all other inquiries email Ashley.